Paraguay helps Singapore overtake Germany for the top spot. Montreal, October 24, 2017 – Paraguay removed visa requirements for Singaporeans, propelling Singapore’s passport to the top of Passport Index’ most powerful ranking with a visa-free score of 159. “Visa-free global mobility has become an important factor in today’s world,” shared Armand Arton founder and president of Arton Capital at the recently held Global Citizen Forum in Montenegro. 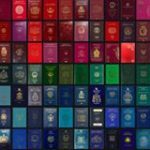 “More and more people every year invest hundreds of thousands of dollars in a second passport to offer better opportunity and security for their families,“ added Arton.